Just what you’ve always wanted: a bathtub wineglass holder that lets you enjoy a glass of wine while taking a bath. In January, Michael Aylesworth launched two fundraising campaigns in hopes of getting funding for his 3D printing idea. His goal was simple: $3000 for each campaign, and within 10 days – his goal was met. But the funding didn’t stop. Due to popular demand, just over $18,000 was raised, and over 1000 products were ordered. Aylesworth is working to meet his commitments on time. The line of products that Aylesworth has launched are called Wave Hooks, 3D printed plastic hooks and accessories that allow you to vertically organize your space. 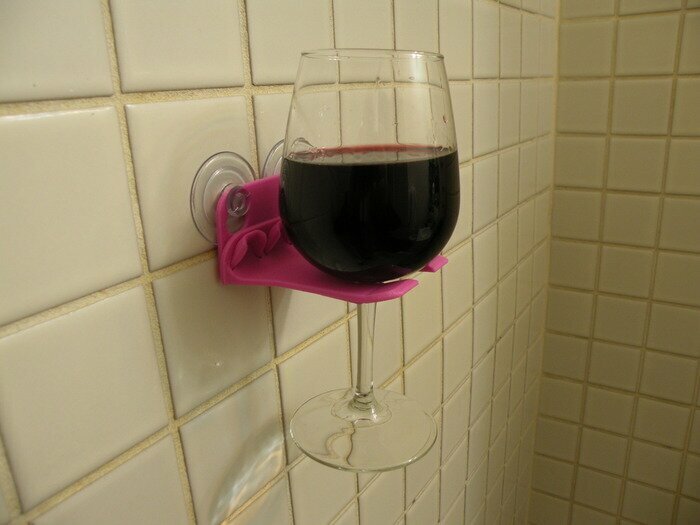 Current accessories for the bath include the Shower Beer Holder, the Cubby Shelf, and the Wine Glass Holder. Wave Hooks are meant to stay put. “Even in a earthquake, it’s not going anywhere,” said Aylesworth. Not surprisingly, the “Wave Hook Bath Tub Wine Glass Holder” is the most popular accessory. Aylesworth estimated that he could print between 50 and 75 products a month, but with the massive order and commitments to have the products finished by May, Aylesworth has partnered up with 3D printing company “MakeXYZ.com,” to make sure his backers get their orders in time. Aylesworth also has plans for the future that involve injection molding, which would allow for higher volume manufacturing. Aylesworth said that this would allow the Wave Hooks to be sold in retail outlets by September. Until then, the Wave Hook Wine Glass holders are available for preorder for $15.